The first time I saw King Hussein’s summer palace, I was on a tour bus heading north. 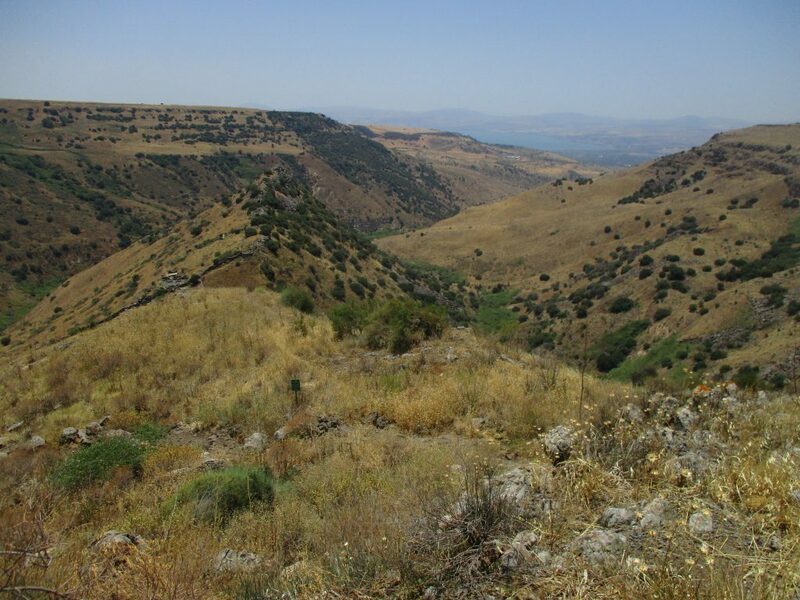 We were going to spend the day exploring the Shomron, part of the Biblical Northern Kingdom of Israel. As we rounded a bend in a sparsely inhabited area just north of Jerusalem, Eve Harow told us to look up to our left, just beyond the large water tank. There on a hilltop I saw what looked to be the metal framework of a large structure under construction. But it was not a building under construction, not any more. In the early 1960s King Hussein of Jordan decided to build a new summer palace in the land his country had captured in 1948. Jordan officially annexed this area in 1950, and called it the West Bank. Only two countries recognized the annexation: Pakistan and Great Britain. Except for periodic trips to the Al Aksa Mosque in Jerusalem, the king had ignored the area. Sometimes when he came to Al Aksa, he stayed at his home in Beit Hanina, at that time a small neighborhood north of Jerusalem. Perhaps on one of his trips, he had seen this hilltop, Tell al-Ful. Perhaps he had even landed his helicopter here, to survey the site. He would have been struck by the beautiful breeze, and the incomparable view of the whole city of Jerusalem, the Judean mountains and desert, and the Dead Sea, beautifully blue in the distance. In 1964, the Israeli government decided to build an official residence in Jerusalem for its President. They announced a competition for Israeli architects to submit designs. King Hussein probably felt he could not be outdone. He consulted architects all over the world to design a suitable palace in Jerusalem, to be built on Tell al-Ful. Ground for the palace was broken in 1964. Construction proceeded at the usual slow Middle Eastern pace. There was no hurry. If the King did not spend this summer near Jerusalem, he would spend next summer here. King Hussein once wrote that the biggest mistake he ever made was attacking Israel in 1967. Less than four days after the first Jordanian soldiers attacked the south of Jerusalem, Hussein had lost all the territory on the west bank of the Jordan River. Work on his summer palace ceased. It still stands today as it was then, an incomplete skeleton of a building. This week I went to see what is left of the palace on a tour with Chaim Silberstein, president of Keep Jerusalem. The organization works to dispel inaccuracies in media portrayal of the city, its history, demographics, and current events. The road up Tell al-Ful is paved only part of the way, so the last portion of the ride was quite bumpy and dusty. But as often happens, the worse the ride is, the bigger the payoff. When the six of us on this tour got out of the car, we all agreed the view had been worth the terrible ride. The first thing we saw was the remains of the King’s palace. The ground floor, second floor, roof, and some walls are intact. Graffiti decorates the walls. A stairway leads from the ground floor to the first floor. The first few steps have deteriorated to a steep pebbly ramp. The steps themselves, where they exist, have crumbling edges. I held the metal railing tightly as I climbed. Chaim mentioned that he had installed the railing himself so he could safely bring visitors. We all ascended very carefully. parapets to keep you from falling off the building. In a couple places, neat rectangular holes in floor could trap the unwary. Were these meant to be openings in which air conditioning ducts or dumbwaiters would have been installed? Chaim took us almost to the edge of each side to point out landmarks. To the south lay the Old City. From this angle, we could not see the Golden Dome of the Rock, but he said in the evening, you can see a flash of gold as the setting sun hits it. To the southeast, a barely visible bit of blue–the Dead Sea–peeks out between the tan Judean Mountains and the blue-gray Mountains of Moab in Jordan. The building has wings going in each direction, so we walked back to the center before walking out to the easternmost edge. Chaim had given us binoculars, and now he directed us where to look for the city of Amman, high in the Mountains of Moab. Between the haze and my elderly eyes, I only saw a fuzzy light colored area. I’m sure King Hussein, had he ever moved into his completed palace, would have had an excellent telescope installed, or perfectly focused binoculars to offer his guests a view of his capital city on the other side of the Jordan River. From our high vantage point, we could see a series of Arab towns and neighborhoods in the eastern part of the city from north to south. From Kafr Aqub, to Beit Hanina, Shuafat, and south through Isawiya and A-tur, to Jabel Mukaber and Sur Bahir, the towns run one into the next with little empty land between them. Arabs can build without any of the permits that other Israelis need, so they do not submit building plans to the municipality for approval. Nor do they need to meet city building codes, including those requiring earthquake-resistant construction. Israel, lying on the long Syrian-African rift, is subject to many small earthquakes every year, some measuring up to 5 on the Richter scale. The country suffers a large earthquake approximately every eighty years, the most recent one having been in 1927. The next big earthquake will no doubt prove disastrous to buildings that are not up to code standards. From 1948 to 1967, all the towns on the west bank of the Jordan River, including Jerusalem, slumbered undeveloped. Since coming under Israeli rule, the Arab population in the area has increased from 55,000 to about 300,000, a more than five-fold increase in less than fifty years. Aerial photographs attest to this growth. These neighborhoods have grown in an unplanned fashion. In photographs, there are no green areas visible and streets have no pattern. These Arab neighborhoods on the eastern side of the city have all developed since 1967. Even the neighborhood around the King’s summer palace has changed. When King Hussein picked the site, nothing had been built on the sides the hill, or even close to it. But the site had not always been empty. Charles Warren was the first archeologist to explore this hill. He dug here in 1868, and identified it as ancient Gibeah, where King Saul had his headquarters, as described in the Biblical book of Samuel. C. R. Conder, in 1874, and William F. Albright, in 1922 and 1923, also excavated here and agreed with Warren. The evidence, they said, supports the view that the first fortress here was built by King Saul and later either he or King David repaired it. Professor Israel Finkelstein disagrees with that opinion. The question of what really lies under the surface of Tell al-Ful can only be answered by further archeological excavations. Many archeologists would jump at the opportunity to dig here. Some have said that Tell al-Ful is the second most important archeological site in Israel after Ir David, the City of David. But unlike most of the land in Israel, this hill is privately owned, by the Hashemite Kingdom of Jordan. King Abdullah has shown no desire to learn the answer. Perhaps Saul was the first king to live on this hilltop with its lovely breezes and view of the mountains of Judea and Moab. Or perhaps Hussein and Abdullah would have been the first kings to do so. Maybe someday we will find out.